Capri one of Wakefields most loved Italian restaurants, which is known not just for its excellent food, but also for its friendly atmosphere, outstanding service and exceptional reputation. Capri has been open for over ten years, and prides itself on creating a guest experience that keeps its diners coming back time and time again! Capri’s team build a buzzing ambience which means guests feel like part of the family. Delicious food and quality service are on the menu at Capri! Capri has teamed up with Carbon Free Dining, the United Nations-backed Restaurant initiative. They have chosen to demonstrate their love for the environment by partnering with the programme. 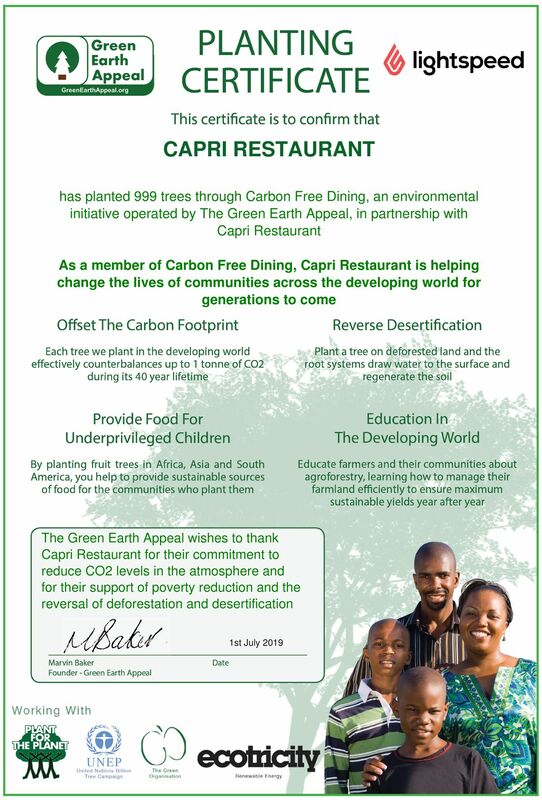 As a Carbon Free Dining Certified partner, Capri plants hundreds of trees each month, effectively offsetting the Carbon Footprint of the meals it serves. This is done by simply giving diners the opportunity of planting a single fruit tree with each bill for an optional 99p.